We promote retail investment and develop the securities markets in Finland. Every investor aims to gain wealth. What matters are the take-home profits. Taxation is one of the essential costs of investment and taxation issues are most commonly discussed in the spring when checking the previous year’s tax returns. However, investors should pay attention to possible tax consequences in advance. Tax legislation and any changes to it may affect the decisions an investor makes. The Finnish Foundation for Share Promotion started publishing an annual tax guide in 1988. 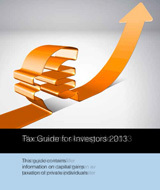 This guide for the year 2013 was updated by tax specialists Lic.Sc. (Econ.) Risto Walden and LL.M Niina Tuovinen from Bilanssi Oy. FFSP would like to thank them for their valuable input. The guide for 2013 was updated taking into account the changes made to tax legislation as of the beginning of 2013, and the changes to the interpretation of tax legislation based on legal practice. From an investors’ point of view, the most significant changes made in 2013 are the angel investor deduction for the years 2013 to 2015, the revocation of the tax exemption for amounts up to 8500 euros in investment insurance benefits in the taxation of gifts, and the increase in transfer tax applied to the sale of shares in housing associations and property companies from 1.6% to 2%, as of 01.03.2013. In addition to this, the taxation of large gifts and inheritances (over 1,000,000 euros) has increased, following a temporary amendment to the law, valid from 01.01.2013 to 31.12.2015. The age limit for withdrawals from new long-term savings accounts was raised to 68 years. We strive to keep the guide up to date, however, we encourage our readers to prepare for any changes that the interpretation of the laws may cause. We recommend that you follow them on our website, www.porssisaatio.fi and in the media. Are you investing in closet index funds?